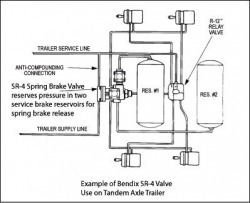 Prior to the change in FMVSS-121 in 1992 Bendix offered two approaches to enabling trailer spring brakes. The SR-2 valve used a separate spring brake reservoir. 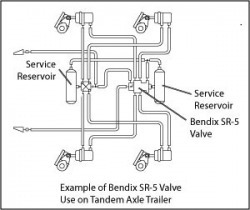 The SR-4 valve advanced this idea by using the two service brake reservoirs to keep the minimum pressure required to release the spring brakes and doing without a separate spring brake reservoir. 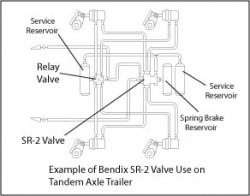 The new regulations in 1992 no longer required dedicated reservoir pressure for spring brake release and Bendix designed the SR-5 valve.